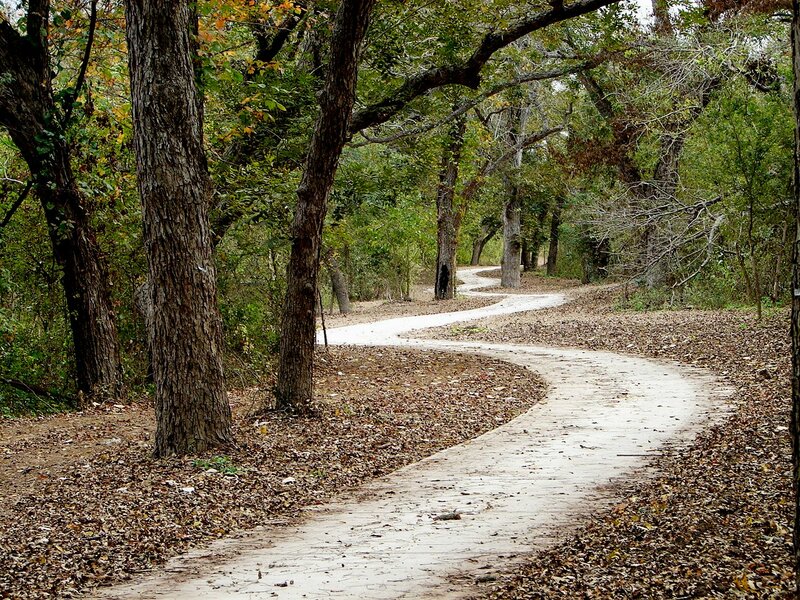 A beautiful, pastoral setting to enjoy nature, history, and recreation along the banks of the sinuous Medina River. 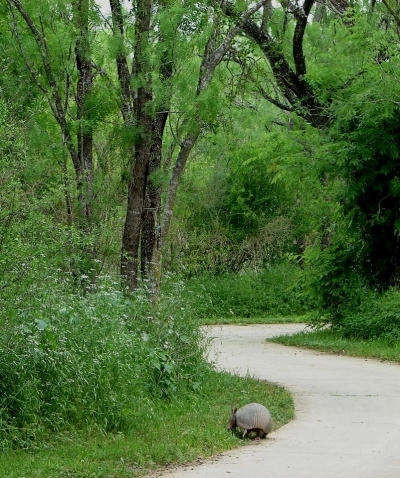 A short trip by car from Downtown San Antonio is rewarded with unbounded natural beauty. Location: Medina River, Southern Bexar County, between Highway 16 and Pleasanton Road. Find Medina River Preserve off Highway 16. Or, Applewhite Road at Medina River. South of Downtown. The Medina River Greenway is currently an example of a rural trail. The trail is flanked in many cases by working farms and the trail serves as a reminder about how important water is for human existence. The Medina River is a very important river for agriculture throughout this part of Texas and also regions of the famed Texas Hill Country. However, this portion of the river is increasingly being encroached upon by human development so the Greenway project in this area has the added benefit of preservation of riparian habitat. In other sectors of the San Antonio Greenway project, we have been retroactive in terms of slotting the trail and greenway into residual areas left over from the vicissitudes of human development of the built environment. The Medina River project has afforded the program the ability to be much more proactive in regard to areas purchased for protection; which have not been altered in the same way as a by-product of development and/or illegal dumping which has occurred on other waterways in more urban areas. We have had opportunities for public/private partnership and collaboration on this trail. Toyota graciously dedicated 650 acres to the program at the confluence of Leon Creek and the Medina River. As is well known, confluences are one of the most important areas that a greenway system can protect. We have also worked closely with Union Pacific Railroad to find ways to get people from one side of the rail track to the other safely. This was an exhaustive process that included many site visits and much debate about where the safest areas to cross would be. 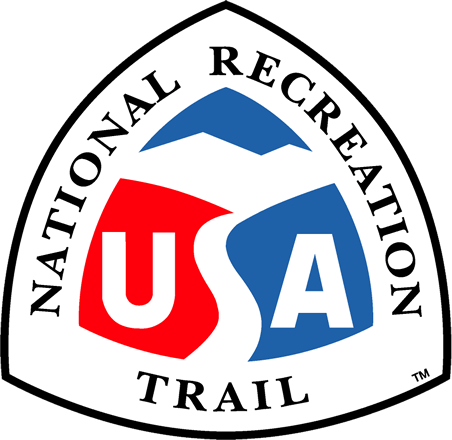 In the end, we were able to work together to find a route that worked for both parties, but most importantly serviced the trail user with safety and scenery to the greatest extent possible. The Medina River area has been important for centuries as an agricultural area. The area's place in history is evidenced by the remains of several cultures along its banks to include: Native American civilizations; ruins from the Spanish Colonial periods; the 1813 Battle of the Medina between Mexican/Tejano Separatists and Spanish Loyalists, two decades before Texas' fight for independence from Mexico (the battle's exact location is still a matter of some debate). The most ancient of these civilizations are evidenced by the Richard Beene Archaeological site; a site of regional and national importance yielding over 80,000 artifacts ranging from between the early to late archaic period. The site is one of several sites in North America to produce relatively complete archaeological records from the last 10,000 years. The Medina Greenway also protects a regional fluvial ecosystem at or near the convergence of 4 major ecological zones to include the South Texas Plain, Blackland Prairie, Edwards Plateau, and Post Oak Savannah. The richness of ecological diversity is special in this area and worth preserving. 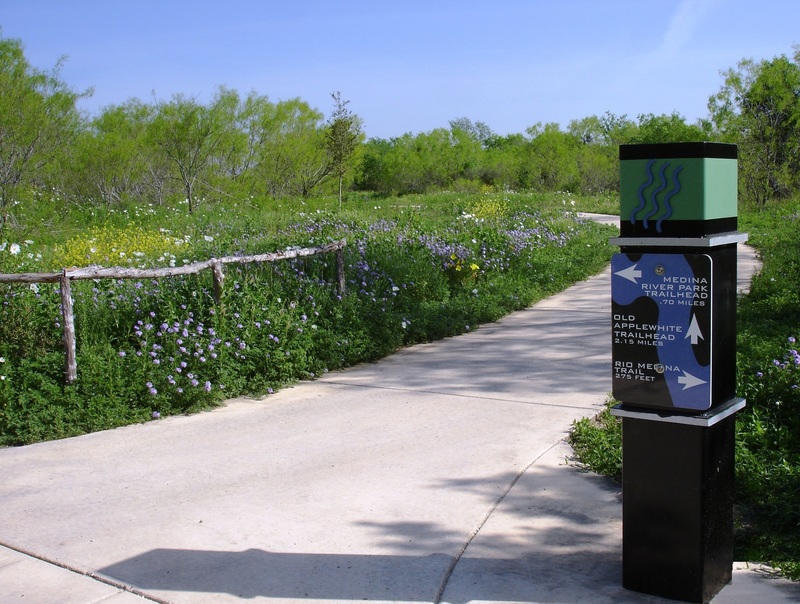 In the Medina River Greenway's case, our program has been able to get in front of the development wave. The roots of development are starting to take shape in the area with the addition of Texas A&M-San Antonio, the Toyota Manufacturing Plant, and the formation of several master planned communities. Hopefully, the success of our Greenway program, which has many different, unique components to it, will preserve the enjoyment of these components individually and collectively for at least another 10,000 years. Medina Greenway with flowers in bloom. Photo by Jody Castro. Bike resting among flowers. Photo by Jody Castro. Switchback on the greenway. Photo by Jody Castro. Medina River Greenway switchbacks. Photo by Jody Castro. An armadillo makes its home within the lush forest that surrounds the Medina River Greenway. Photo by Adelyn Alanis. Autumn leaves on the Medina River Greenway. Photo by Adelyn Alanis. Spring brings thousands of yellow and violet wildflowers to the Medina River Greenway. Photo by Brandon Ross. 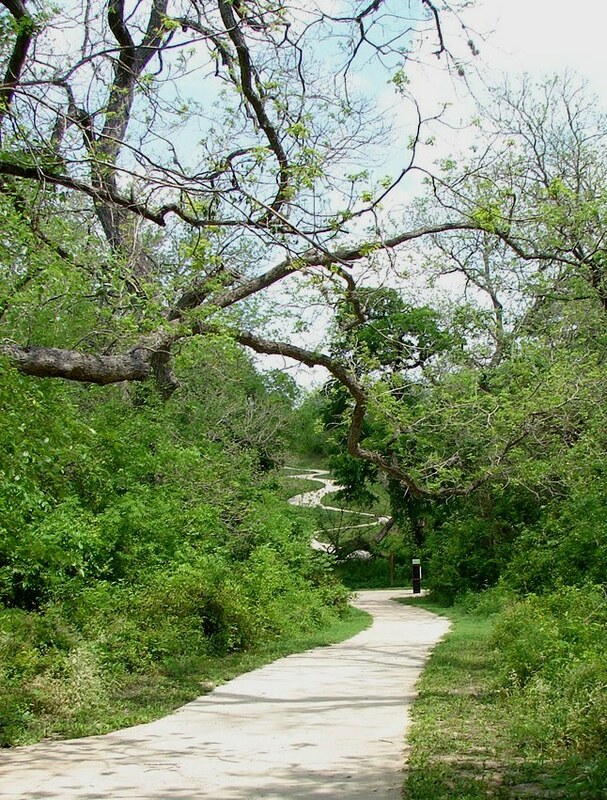 Switchbacks on the Medina River Greenway. Photo by Adelyn Alanis.